For the past three years Jeremy Corbyn, leader of the British Labour Party, has been embroiled in an antisemitism scandal. As a defence against these charges – Jeremy has frequently invoked the actions and values of his family as evidence of his stance on antisemitism – particularly his mother’s alleged participation at the Battle of Cable Street – a stand off between fascists and British Jews who were assisted by Irish residents and trade unionists. 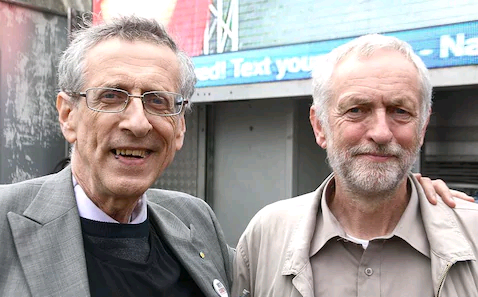 With this in mind we are invited by Jeremy to look at the actions of other family members – including his brother Piers Corbyn – a strong advocate for a Labour government under a Jeremy Corbyn leadership and someone whom Jeremy has previously said he fundamentally agrees with. By this metric – which Jeremy himself has initiated – it doesn’t look good. This October I highlighted a tweet sent by Piers that asserted antisemitic ideas of Jewish financial control of the world, that these Jews are the new Nazis and that they brainwash humanity. Putting aside the fact he shows a lack of insight into how British law works – and that the caps lock button on his computer appears to be broken – the threat was an attempt to intimidate and bully me into silence and stop anti-racists from highlighting antisemitism. The arbitrary noon deadline Piers set me has since passed and I’ve heard nothing from him. So let’s cast some sunlight on the antisemitic, alt-right-esque and neo-Nazi-style rhetoric frequently employed by Jeremy’s brother. Let’s never forget that Robert Bowers – the white supremacist who murdered eleven elderly Jews praying in Pittsburgh ALSO believed in these conspiracy theories. The Anti-Defamation League have resources that go into detail on these antisemitic tropes about Jewish financiers controlling the world for anyone who wishes to learn more. Is there a direct line between Piers Corbyn and the Jew-killing Robert Bowers? No. I’m sure they’ve never been aware of each other’s existence. Does Piers help keep alive antisemitic conspiracies that lead to real world hatred and violence against Jews? Unequivocally yes. It doesn’t matter whether you are on the left, on the right, whether you are a David Icke style conspiracy theorist, a Christian antisemite, an Islamist or a regular person who has generic antisemitic attitudes: these Jew-phobic ideas all overlap, intersect, buttress and reinforce each other. After Pittsburgh there is a tendency from some on the left to puff themselves up by attacking the right for their antisemitic rhetoric – quite right – but we’re calling time on the left’s antisemitic rhetoric too. I really don’t care whether the antisemitism goes into my left ear or my right – it all sounds the same to me. Whether he is consciously aware of it or not – the ideas of the far right evidently hold a strong appeal for Piers as he frequently spreads their propaganda to his 15,000 followers – including his brother Jeremy. This tweet is like a tapas of antisemitic conspiracy theory for anyone hungry for Jew hate. Whilst Piers wouldn’t self-identify as being far right or an antisemite – and he would protest the labels in good faith – there’s a pattern revealing he is unconsciously infatuated and seduced by the racist rhetoric of neo-Nazis. We might say the same about Jeremy Corbyn – substituting rhetoric with Nazi style imagery. In both these instances they can brand themselves as leftists – but Nazi imagery was instantly appealing to them – so much so that Piers wanted to share it with his followers and Jeremy wanted to publicly praise it. Firstly, he irrelevantly and antisemitically dragged in Israel-Palestine. Coupled with this is an instantaneous knee-jerk reaction to antisemitically regard a Jew’s words as dishonest, untrustworthy and concealing an ulterior motive. Then we see the same treatment that Jewish politician Bernie Sanders received – to be characterised as some kind of traitor. In this instance the British Jewish MP is branded a Zionist. There’s nothing wrong with being Zionist – after all it’s the emancipation and indigenous rights movement of the Jewish People. But the implication is that she puts another country before her own – that she is a filth column traitor. And she was damned with this accusation of treachery simply for being a Jew speaking out against racism targeting her Jewishness. Jeremy Corbyn fundamentally agrees with racist abuse and slander. It claims that Jewish DNA prevents them from understanding antisemitism. Then, in a huge cocktail of victim-blaming and racial slander, it accuses Jews of being responsible for racist abuse targeted at them – and asserts that they are engaged in a war against all non-Jews. There’s no way to dress this up – these are the same ideas Adolf Hitler had in Mein Kampf and which provided the racist foundation of the Holocaust. This is the man who Piers Corbyn has found common ground with and who he copied into a tweet threatening legal action against me for highlighting antisemitism. This is the man who Piers Corbyn continues to work with and finds common ground with – a racist bully who perpetuates the same antisemitic motifs used by the Nazis of last century and the Nazis of today. And let’s be clear: the overarching antisemitic themes shared by Mark echo the template of Jewish malevolence, control, deceit and manipulation that is to be found in the tweets Piers has personally written and retweeted. These are the men trying to silence a Jew from speaking out against antisemitism. Even though prone to conspiracies and hashtag heavy in his tweets – it is wrong to dismiss people such as Piers as just a crank. His online behaviour is not a frivolous joke. Ideas matter. When Robert Bowers gunned down the Jews of Pittsburgh he did it with an idea in his head – a “globalist” idea that Piers Corbyn helps propagate – one of many antisemitic ideas he helps propagate. Jeremy Corbyn has frequently declared he will fight antisemitism wherever it exists and whoever it comes from. I could make a pointless demand that Jeremy Corbyn should condemn his brother’s antisemitic rhetoric. I could say that if Piers is a member of the Labour Party they must remove his membership. However, we know there’s no point. Jeremy Corbyn and the Labour Party are three years past the point of redemption when it comes to dealing with antisemitism. At the time of writing this, the police are investigating criminal acts of antisemitism that the Labour Party failed to deal with or pass on to the police themselves. Jeremy Corbyn himself has said he agrees with at least one of his brother’s antisemitic tweets. Add to this the fact that he’s a man who has spent his career supporting and championing terrorist groups whose explicit goal is to exterminate Jews; who laid a wreathe at the site of Black September terrorists who orchestrated the castration and murder of Jews at the Munich Olympics; who praises art depicting hook-nosed Jewish bankers controlling the world; who celebrates Raed Salah – a man who calls Jews germs and invokes the blood libel against them; who bullies British Jews by implying that even though they’re born here they aren’t truly English; who speaks passionately at Hezbollah rallies – an Islamist terror group whose flag features a machine gun and who call for the murder of Jews around the world; and who has donated money to known holocaust deniers. So it is now simply up to civil society to shame the Corbyn Project and reject the institutionally racist Labour party. It’s time to be clear that anyone who supports Labour in it’s current guise is complicit in normalising and mainstreaming racism. I say this as a man who voted Labour his entire life but cannot whilst the Corbyn project rots the party – a far left movement that has the politics of antisemitism at the core of it’s DNA. The shame is entirely on those who’ve enabled this. We can also pressure Twitter to look at the accounts of Piers Corbyn and Mark Windows. There are doubts twitter will do anything. Right now Louis Farrakhan’s account remains active, even though he has used it to describe Jews as “termites”. But again, it is up to civil society to get on with the grim task of exposing and shaming antisemitism wherever it exists and whoever allows it to breathe unchecked. Because antisemitic ideas like those shared by neo-Nazis, white supremacists, the alt-right, the Far Left, Louis Farrakhan and conspiracy theorists lead to antisemitic actions. Jeremy Corbyn has invited us to look to his family for proof of where he stands on antisemitism. We now have proof of where his brother stands. Perhaps we should ask for proof of whose side Jeremy’s mother was on when he claims she was at Cable Street.